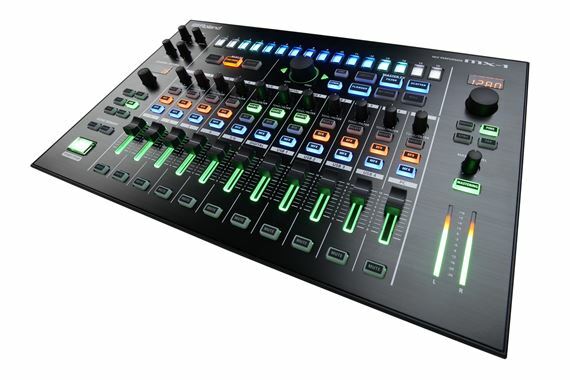 Order your Roland Aira MX1 Performance Mixer from AMS and enjoy 0% Interest Payment Plans, Free Shipping, Free Extended Warranty & 45 Day Money Back Guarantee. Computers already play a big role in production, and they increasingly play a role in performance. But they don’t always integrate so well with other live instruments, and require their own audio interface and controller. The MX-1 addresses these problems through its ability to operate in any one of three different modes. In Control Surface mode, the MX-1 can sync to your computer and act as a high-quality MIDI controller for your DAW. Cool. 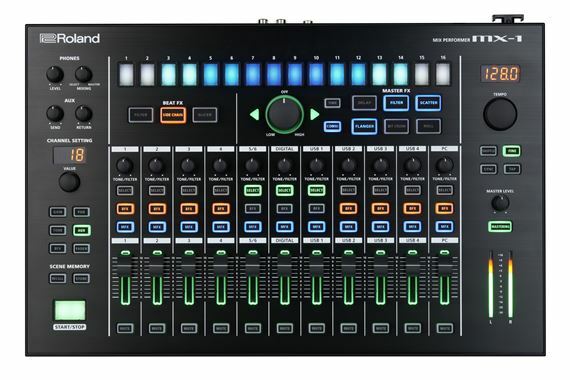 In Mixer mode, the MX-1 can mix all connected sources, including analog and digital inputs, AIRA gear, and your computer’s output. While there’s a dedicated channel for a stereo output from your computer, you can also send computer audio to USB channels 1 thru 4 if no device is connected to the AIRA Link USB ports. 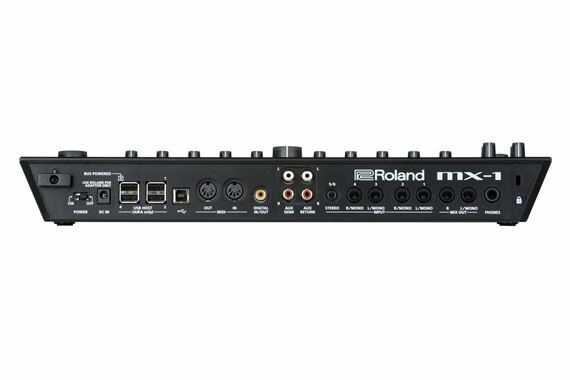 In External mode, the MX-1 can send all its inputs directly to your DAW, acting as a high-quality audio interface. At the same time, it can mix 18 channels back from your DAW, putting them on the MX-1’s faders. This lets you utilize the recording, clip triggering, effects, and mixing functions of your DAW along with the MX-1’s cue monitoring, sync, and performance-optimized mixing and effects capabilities. The MX-1 is so much fun to play that you’re bound to want to plug all kinds of things into it. Four individual 1/4-inch jacks support just about any kind of instrument, and the stereo 1/8-inch jack is perfect for smartphones, tablets, and various gadgets. There are also four AIRA Link USB ports that make connecting your AIRA gear literally plug and play. With fully automatic detection, AIRA Link USB ports transmit audio, MIDI, and sync over a single USB cable. One of the ports can even provide bus power for a compatible AIRA device like the TB-3 Touch Bassline or VT-3 Voice Transformer. AIRA Link reduces cable clutter and makes setup fast and simple. The MX-1 is also fully time aware and gives you hands-on control of start, stop, tempo, and timing. Sync an array of musical devices over MIDI or AIRA Link. Control everything with the brightly lit TR-style start/stop button and large tempo knob with fine adjustment, shuffle control, and tap function. Dynamic Range: AD block INPUT 1--4: 100 dB typ. / AD block INPUT 5/6: 100 dB typ. / DA block MIX OUT: 108 dB typ. This mixer is the answer to my studio needs. Very flexible to use with what you can do with Ableton. It's easy to navigate giving it a fast operator learning curve. Great sound and very sturdy! I'm not afraid to lug it around. It definitely gives my live setup an easier flow work for both production and performance.